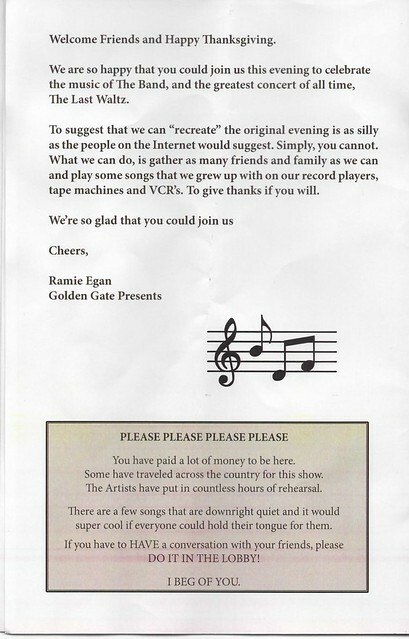 The concept of an all-star band can be a hit or miss prospect, but the people at Golden Gate Presents have pretty much been all hits. The organization that brought together an impressive amalgam of talent to perform the Complete Last Waltz, has now produced four “Alone & Together” tours, and the latest version was on display at Music Hall of Williamsburg this past weekend and it too was a resounding success. 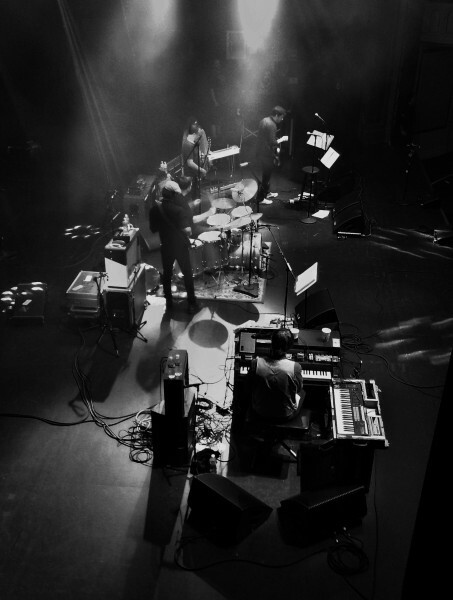 This year’s A&T tour included old favorites Eric D. Johnson (Fruit Bats), Elvis Perkins, and Sam Cohen (Yellowbirds) sharing various instruments and the vocal duties, and accompanied by a rhythm section of Joe Russo (JRAD, The Duo), and Josh Kaufman (Yellowbirds). This particular night also saw the return of last year’s participant Kevin Morby as a guest for two numbers. The quintet performed their own material, performed each other’s songs, and sprinkled in a few tasty covers. If this band seemed to naturally gravitate towards each other, its of course from their rich talents as ensemble players but also because the various members have performed in a variety of configurations in the past (including the Last Waltz). So when it came time for Sam Cohen to sing an Elvis Perkins song for example, the performance seemed both familiar and natural but also instinctively a tribute. This was one of those shows that was so comfortable and enjoyable for the listener that a two-hour set seemed to fly by. Undoubtedly, we’ll be seeing these individual players in the near future in their other projects, but this Music Hall performance makes me hope there’s a fifth edition of the Alone & Together series. I recorded this set with the Schoeps cards mounted inside the soundboard booth and mixed with an extraordinarily well balanced feed from FOH Pete Costello. The blend of sources is about 50/50 because the room mix was so strong and our advantageous position yielded excellent results. The sound quality of this recording is superb. Enjoy! At this point, it is apparent that Joe Russo’s Almost Dead has achieved its mission of providing a fresh approach to the task of covering Grateful Dead songs. And at a Festival that has thrived on ability to provide a reliable recreation of the classic rock genre, JRAD were an easy stand-in for the greatest improvisational rock band of its era. The Grateful Dead made a one stab at the massive task of performing the band’s ultimate rock opus “Terrapin Station” in its entirety, but the performance failed to capture the majesty of the suite that owns the entire second site of the Terrapin Station album. “Terrapin” is perhaps the Grateful Dead’s crowning achievement in musical composition, but the complexity of the last half of the suite was not a task that the band had the fortitude to undertake at a live show and so it was only the first two sections that were performed consistently since its 1977 debut. 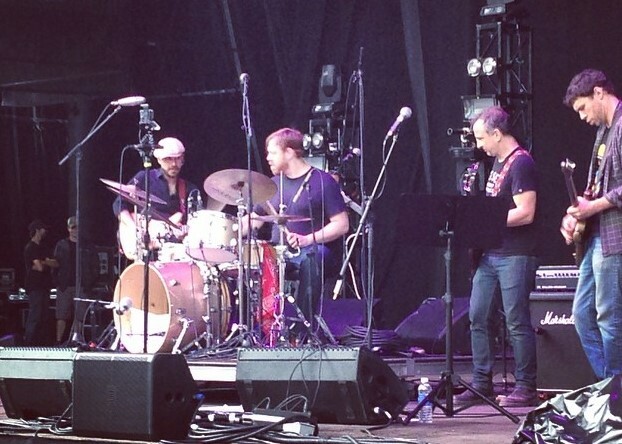 JRAD opened their set at Mountain Jam in the pouring rain with a jam that seamlessly merged with “Lady With A Fan”, the opening section of the Terrapin suite. When the band concluded the first section of the main theme and proceeded to the “Terrapin Transit” portion, it was a moment to smile. JRAD consistently takes this music to places where the original band never trod, and this was just another example — and the fun had just begun. Lead by the stunning keyboard work of Marco Benevento, JRAD took each section of the suite and transformed them into complete songs of their own. It was a breathtaking thirty-two minutes and this is a recording I’ve already sampled thoroughly four times and undoubtedly will experience many more times. The balance of this set consisted of meaty and committed versions of three more songs but the take away from this short JRAD experience was undoubtedly the complete Terrapin suite. I recorded this set with the Neumann large diaphragm cardioids in a very advantageous location up the hill in front of the soundboard area. Considering the elements at the time of this performance, overall this is an outstanding recording. Enjoy! Our soundboard/audience matrix recording of JRAD at the Capitol Theatre is still available here. Download or Stream the Complete Concert at Archive.org [HERE]. 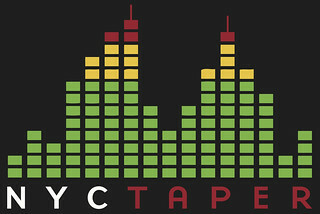 If you download this recording from NYCTaper, we expect that you’ll please support these artists, visit the JRAD website, visit the JRAD Facebook page, and visit their individual websites and purchase their official merchandise. Benevento-Russo Duo [HERE], Marco Benevento [HERE], Tom Hamilton [HERE], Scott Metzger [HERE], and Dave Dreiwitz [HERE]. We’ve been with Joe Russo’s Almost Dead from their very first show at Brooklyn Bowl, so it was especially exciting to see the band in the big room at the Capitol Theatre in Port Chester. Given the special historical relationship between The Cap and the Grateful Dead, this gig was a kind of affirmation for JRAD. And the fans agreed — this date sold out quickly and well in advance. So there was a palpable sense of excitement when the band took the stage and immediately burst into a ’76-77 era version of “Dancing In the Streets” filled with neat funky guitar fills and tons of energy from the rhythm section. JRAD is always full of surprises, but what happened next was especially nice for us here at NYCTaper — the entrance onto the stage of friend of the site Nicole Atkins. Nicole ostensibly performed the “Donna parts” throughout the night, except that she’s a significantly better vocalist than Donna Godchaux ever showed during her time in the Grateful Dead (check out Nicole’s solo verses on “Music”). And as expected, Nicole provided a series of breathtaking moments throughout the night, highlighted by her solo rendition of Pigpen’s late era classic ballad “The Stranger (Two Souls in Communion)”, which like all JRAD performances balanced the tender line between tribute and respectful original take on the music. It was an interesting choice of material to feature Nicole on lead vocals and the selection proved brilliant. This night was also featured an abundance what we have come to expect from JRAD shows — inspired and collaborative improvisational work which imparts new life into well-worn material. The version of “Dancing” definitely took its flavor from the late 70s GD, but JRAD took it out deep, and when the song reached to the final chorus after nearly twenty-minutes, it returned from places the Dead never imagined. “Cassidy” is a track that became fairly static in the later years of GD performances, which was a shame because the composition offers a jam-ready mid-song interlude. As expected, JRAD took that offer and upped the ante considerably. The mid-“Cassidy” jam contained a Playing-like deep space that gradually reached a manic Caution-like climax that we didn’t expect would ever return to the song proper. But return it did, ever so briefly, before exploding into a ’69-style “St. Stephen” that nearly took the roof off the old place. The first set continued with an extended “Eyes” that teased “Loose Lucy” before it flowed into a celebratory “Not Fade Away” that closed the meaty set. The second set’s opener “Music Never Stopped” followed the same path as “Cassidy”, taking a fairly static GD song that offered space for improvisation and taking full advantage. This “Music” extended past fifteen minutes before it returned to the final refrain. The remainer of the show was notable for its continued intensity, imaginative song selections and the true dedication to the music exhibited by all. By the time the band reached the set’s final song, a sweet “Ripple” encore, it was clear that Joe Russo’s Almost Dead had truly done the historic Cap proud. This recording is a special one for the site. We were granted access to a soundboard feed in order to mix a special “matrix” of this show. I set up the mics in the taper’s section at the front right corner of the soundboard cage. I utilized the Schoeps cards and added the Grace V3 as a pre-amp to sweeten the capture. The room sounded terrific and the crowd was fairly respectful. The board feed was impeccably mixed by JRAD FOH Pete Costello — a perfect stereo pan, complete separation and superb balance. The matrix mix is fairly even between board and audience. The result is one of the best recordings we’ve ever offered on this site. Enjoy! This recording would not have been possible without the generosity and assistance of three separate entities — the outstanding staff at the Capitol Theatre, Pete Costello, and of course the members of JRAD. 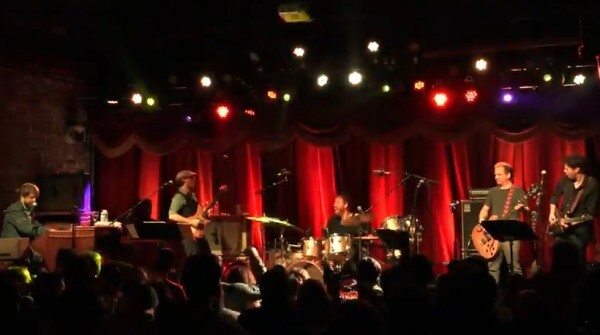 It was almost exactly two years ago when Joe Russo’s Almost Dead made their debut at the Brooklyn Bowl. In our somewhat controversial review of that show, we found the band’s approach to the music of the Grateful Dead both musically proficient and extremely refreshing. JRAD is a core group of friends and accomplished musicians whose take on the GD catalog was that night in stark contrast from the world of “post-Dead” which had become to me uninspired to the point of becoming almost a gimmick. I’m happy to say that the last two years have proved us entirely correct. As “post-Dead” prepares to say “Fare Thee Well” this summer, JRAD has been an unqualified success. The band has toured several times throughout this period, and last month teamed with Phil Lesh to play a series of New Year’s shows at the Capital Theatre in Port Chester NY. This weekend JRAD returned to where it all began for two very sold-out shows at the Brooklyn Bowl for the “Freaks Ball”. We attended and recorded both but offer up the second night first because this was truly a remarkable performance, surpassing anything that I could have reasonably expected from this group. The night began with what appeared at first to be a faithful take on Pigpen’s “Alligator” — that was until the jam segment when it became very apparent that JRAD would recognize no boundaries on this night. Led by the thundering bass of Dave Dreiwitz, JRAD weaved in and out of a “Caution Jam” that touched on themes as varied as “Rider” and “Slipknot”. The set’s opener would last nearly seventeen minutes before evolving into “Jack A Roe”. This traditional number was for the Grateful Dead almost always a short first-set Garcia-led song that followed a very specific pattern. For JRAD, there are no patterns as Jack A Roe became a ten-minute exploratory jam vehicle that led very nicely into a celebratory “Uncle John’s Band”. The balance of the first set continued with some interesting song selections that kept the energy high with much more to come. Saturday night’s second set was the highlight of weekend with a “Music Never Stopped” opener that went into some deep space mid-song before returning to finish in resounding fashion. What followed was truly the most inspired song we’ve seen JRAD perform — an eighteen-minute take on “Cumberland Blues” that stretched the song to previously unheard limits and really encapsulates what makes this group special. We’re streaming this song below. The balance of the second set was filled with multiple highlights and featured a wide variety of surprises and interesting and intelligent interpretations of the familiar catalog. I recorded this set with the Schoeps cards riding very high on a stand about 30 feet directly in line with the right stack. Other than the persistent din of crowd yapping, this is a quite excellent recording. Enjoy! If you download this recording from NYCTaper, we expect that you’ll please support these artists, visit the JRAD Facebook page, and visit their websites and purchase their official merchandise. Benevento-Russo Duo [HERE], Marco Benevento [HERE], Tom Hamilton [HERE], Scott Metzger [HERE], and Dave Dreiwitz [HERE]. We’ve had plenty of opinions aired on this site about the various incarnations of post-Grateful Dead bands — including praise for Joe Russo’s Almost Dead last year at Brooklyn Bowl and Phil Lesh and Friends at last year’s Mountain Jam. What we got here at Central Park’s Rumsey Playfield this past Wednesday was a kind of turbocharged version of the last Phil and Friends set we saw, with this one featuring Warren Haynes, Joe Russo, John Medeski, Ross James, Jordan Levine and John Scofield. With this kind of monster lineup, even by Phil and Friends standards, it was kind of hard to go wrong. This set featured a sweet lineup Grateful Dead classics and other people’s songs they liked to play, fully realized in these musicians’ own unique style. Vocal duties were shared among the group, with Haynes a welcome addition on that front. The park was packed for the sold-out event, and despite the unpredictable and chilly weather, the band had the crowd dancing in no time. By the time the 10PM curfew arrived, cutting short what could have been a longer “Goin’ Down the Road Feelin’ Bad”, we had already been treated to three and a half hours of music, making for a memorable night that we still didn’t want to end. I recorded this set with Schoeps MK4V microphones in the official tapers’ section, which was behind the soundboard. While it should be as good or better than any other tape from that location, I’ll admit it’s nothing special. The Rumsey Playfield sound system isn’t loud, there was a walkway in front of us, and the section itself wasn’t exactly the most attentive portion of the crowd, either. That said, it’s an accurate reflection of the night, and if you weren’t there, it’s worth hearing what you missed. We know from recent experience that the group of musicians who call themselves Bustle In Your Hedgerow can play Grateful Dead music to perfection, and that they also excel at the music of The Band. But it was as an annual Led Zeppelin cover band that Joe Russo, Marco Benevento, Scott Metzger and Dave Dreiwitz first mastered the art of melding classic rock with their own jazz/fusion/rock/jam style. And now, Bustle has existed as a project for more than ten years. On Friday night at Brooklyn Bowl, it was the second night of this year’s two-show Bustle run and the band’s energy was clear from the outset. The material speaks for itself, but its the ability of the Bustle quartet to bring their own special interpretation that creates the magic that these musicians can impart to well-worn songs. In the first set, it was the stretched out “Heartbreaker” that stood out primarily because of Metzger’s extended guitar solo and the set final “Over The Hills” was a classic example of primo ensemble work. In the second set, we were impressed with the spot-on versions of “Kashmir” and “Song Remains The Same”, both of which are streaming below. Also remarkable was the extended jam segment and seamless segue between “In The Evening” and “Four Sticks”, two entirely unrelated tracks from different segments of the Zep’s career which Bustle interplayed perfectly. We expect that this outstanding quartet will continue to play the Zep for the foreseeable future, but we’re also on the edge of our seat to see whatever classic band they reinterpret next. I recorded this set with the Sennheiser Cards mounted on the right side midway on the floor and mixed with an excellent board feed. The mix of the two sources really came out well, and we’re pleased to report that the sound quality of this set is superb. Enjoy! If you download this recording from NYCTaper, we expect that you’ll please support these artists, visit their websites and purchase their office merchancise. Benevento-Russo Duo [HERE], Marco Benevento [HERE], Scott Metzger [HERE], and Dave Dreiwitz [HERE]. Cass McCombs new album Big Wheel and Others is a real departure from his recent work. In 2011, he released both Wit’s End and Humor Risk and both albums owed much to the influence of the more sleepy Laurel Canyon music school. The shows in support of those albums were compellingly mellow and in particular the Bowery show in 2011 was one of the best shows we saw all that year. But Big Wheel is anything but sleepy — its pretty much a straight rock album and an ambitious double album at that. The tour in support of the album has been a lengthy cross-country trip that arrived at Bowery Ballroom on Thursday night. Cass’s band is a quartet of individual renowned in their own right, with the drums manned by Joe Russo, whose name has popped up often on this site in 2013. Dan Iead from the late great powerpop band The Broken West played both lead guitar and pedal steal, with versatile Portlander Jon Shaw (Battle Hymns and Gardens, Ez Weiss Quartet) (correction, thanks to comment: “Wolf!, Shpongle, Nicole Atkins, The Broken West, The Complete Last Waltz, etc”) on bass. The strength of the band was obvious from the start, as the album opener led off the set with a burst of energy. We’re streaming that track below. The balance of the set was a nice mix of material young and old — there were just six of the nineteen Big Wheel songs along with a democratic selection from each of Cass’s prior records. The Cass McCombs US tour is over, but he’ll be in Europe for six weeks in January and February. I recorded this set with the Sennheiser Cards mounted at our usual spot in the center balcony. The room mix was quite superb with kudos to Cass’s tour FOH Chris Preston. We mixed in a very conservative amount of board feed to supplement the room mics and the sound quality is quite excellent. Enjoy! If you download this recording from NYCTaper, we expect that you will PLEASE SUPPORT Cass McCombs, visit his website, and purchase Big Wheel And Others from the Domino Records website [HERE]. It took place on Thanksgiving night 1976, and it is perhaps the greatest rock and roll concert ever — certainly in the top ten. As a concert, The Band’s The Last Waltz featured one of the premiere acts in the history of rock music retiring from touring in their prime and playing their greatest material accompanied by a who’s-who of guests. This isn’t just a few cameos from some big names — these are all-time performances from the greatest of the great. Dylan, Clapton, Neil, Van, Joni, and many others including everyone from Neil Diamond to Muddy Waters. The movie was directed by Scorcese is also perhaps the best concert film ever recorded. As a tribute to this remarkable and historical event in music history, The Complete Last Waltz is a project of tremendous ambition and respect for the history of the event. Last year the project was performed in San Francisco, but this year it moved East to the Capitol Theatre in Portchester on Thanksgiving Eve. The house band presented a bookend of sorts for this year for me personally, as the musicians were in large part the same group that had performed so admirably for Joe Russo’s Almost Dead at Brooklyn Bowl in January. On this night, the band lead was taken by Sam Cohen and he did an extraordinary job both performing the songs to which he was assigned and passing the spotlight to the queue of outstanding guests. For this four-hour event it would be unwise to summarize every highlight, as there were plenty. I’ve chosen to stream four tracks from this event, which were personal favorites. Eric D. Johnson of the Fruit Bats (RIP) performed Van Morrison’s “Caravan” with Van’s 70s energy and his clothing outfit, including the bell bottom jeans. Eric Earley, from nyctaper-faves Blitzen Trapper, performed the entire Dylan suite impeccably with “I Don’t Believe You” echoing the career highlight of the Dylan & The Band collaboration, the 1966 tour. Another site favorite Cass McCombs played three Band songs, of which we thought he completely nailed “Stage Fright”. Finally, Kenny Siegel of whom we were not previously familiar summoned the ghost of Richard Manuel for a perfect rendition of “The Shape I’m In”. But those four songs are just a sample of the amazing music made that night. If you were there (and listening) you know from what I speak, if you were not there please download and experience this show. I recorded this set with the four-mic rig from the unfortunate official taping location in this venue, which is situated behind the soundboard and about 30 feet back from the balcony overhang. The other unfortunate circumstance at this show was the outrageous persistent yapping from much of the crowd — I mean people just would not stop talking. This despite a very nicely worded request on page two of the official Program asking people to refrain from talking or move the lobby. With those two very big caveats, please enjoy this recording! If you download this recording from NYCTaper, we expect that you will PLEASE SUPPORT The Complete Last Waltz, visit the Facebook page, and support the many artists by following the links on the setlist to purchase their official material, for instance at the Royal Potato Family Records site where several artists reside [HERE]. If you have any interest at all, even passing, in the music of the Grateful Dead, then what happened at Brooklyn Bowl on Saturday night was an important milestone in the post-Dead era. I do not exaggerate, this was a big deal. In the seventeen years since the death of Jerry Garcia and the dissolution of the Grateful Dead as an active band, there has been a steady and sometimes tiresome parade of bands attempting to “capture the magic”. In 2009, such a group even went as far as to tour as “The Dead”. One band plays complete setlists from historical Dead shows. Invariably those bands offer some connection to the band, often an original member or two, and some excellent musicianship — but there is always something lacking. Those bands can mimic the sound and usually feature a wiz guitarist with the ability to ape Garcia’s original sound. But the inherent problem is that it all seems so canned and knock-off-ish, lacking in originality and ultimately devoid of any magic at all. Sure, there are moments, or sets, or even complete shows that are rewarding in the short term. Phil Lesh and Friends has perhaps the best track record in terms of sustained performance quality. But as a whole the entire post-Dead era seems to be just a steady beat of disappointment. On Saturday night, I saw the first post-Dead band that truly offered music that rivaled the original band at its peak. But what separated Joe Russo’s “Almost Dead” from the others was their approach to the music. This was not a mimic or an imitation, but a quintet of supremely talented musicians interpreting the music in their own unique manner. The two guitarists, Scott Metzger and Tom Hamilton, have carved out excellent careers on their own merit. And thankfully neither sounded really anything like Garcia. Marco Benevento used his many talents on an assortment of keyboards to play in his own style, not like Godchaux or Constanten or Mydland. Dave Dreiwitz played an Alembic bass, but his style is nothing like Phil Lesh. And Russo, sure he plays for “Furthur”, but with Almost Dead his drums were a lead instrument — he was able to stretch out and play in a way that the restrictions of a “tribute” band don’t allow. And play they did. Over three hours in two lengthy sets. The highlights were bountiful, but it was the little moments that captured the night for me — a space jam in the middle of Althea, a blazing Shakedown Street (streaming below) that literally began on the last note of Tennessee Jed and continued into a very original jam, the 1973-era “Stronger than Dirt” instrumental post-Eyes jam, multiple teases of Caution in and out of The Other One, and an incredibly huge and energetic Viola Lee Blues (streaming below) that pushed the show to over three hours. Given the incredible results of this show from a musical unit that only plays occasionally, its hard to fathom that “Almost Dead” might be a one-off or a once a year event. Maybe in the post-Dead era, that’s also the right approach to this music. Get it right, and then let it go. We always have the tapes. If Joe and friends decide to do it again, however, I’ll be there. It may not be like the first time, but it won’t be a disappointment. I recorded this set with the four mic rig from the right side of the venue, about 30 feet from the stage. The sound in the Bowl on this night was perhaps the best its ever been, and I’m really pleased with the outstanding results of this recording. Enjoy! This Recording is now Available for Download in FLAC and MP3 and for Streaming at Archive.org [HERE]. If you download this recording from NYCTaper, we expect that you’ll please support these artists, visit their websites and purchase their office merchancise. Benevento-Russo Duo [HERE], Marco Benevento [HERE], Tom Hamilton [HERE], Scott Metzger [HERE], and Dave Dreiwitz [HERE].